This is where you need to go to complete Mayor Runkle's quest. The first thing to do is explore the trees to the north to kill some Cave Slimes. After you've killed the Cave Slimes you'll see a lot of Undead wandering around. They aren't hostile until after you accept Vahkos' challenge. Ignore them for now and make your way to the southwest corner of the tomb. Pull the western of the two levers and then leave it alone for the rest of the time you're here. Pull the eastern level once and then make your way over to the northwest corner of the tomb. Again, pull the western lever once and then leave it alone. Pull the eastern lever twice. Go through the secret passage just east of the levers. 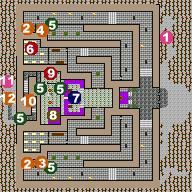 Make your way along the passage until you see the portcullis just west of a set of stairs. Go through the portcullis and then through the locked door to the west. In one of these crypts is a Thinking Cap. Go back to the levers in the northwest corner and pull the eastern lever again, then go over to the southwest corner of the tomb and pull the eastern lever once. Go through the secret passage on this side of the tomb and make your way to another portcullis just west of another set of stairs. This takes you to a room that's a mirror image of the area where you found the Thinking Cap. The only thing in here is a Healing Potion though. Now go back into the passage and continue along towards the center of the tomb. After going through a door you should find yourself in Vahkos' room, and Vahkos is standing on a platform to the west. Talk to Vahkos, and accept his challenge. Doing this will immediately make all the Undead hostile, so go back through the tomb killing them all. After killing all the Undead, including Vahkos, who drops an Amor Ring, make your way back to the central room. There's a secret passage on the western wall of the platform Vahkos was standing on, near the northwestern corner. This takes you into Vahkos' treasure room. Go to the south of the room first, and read the northern of the two tomes. This teaches you Terror Lv.3. Now go through the portcullis to the north and check the chests for a variety of items, including a suit of Mithril Chain Mail. Check the wall directly west of the secret passage into the treasure room to find another secret passage. This takes you back into a long passage with some barriers and a large batch of quickfire. Dispel the first barrier, which is a Force Barrier, but leave the two Fire Barriers alone, since they're holding the Quickfire in that one place. Dispelling those barriers will allow the Quickfire to fill the passage entirely, making it hard to get out again. Go all the way to the end of the passage, which ends in yet another secret passage. Go through here and you'll find yourself in a little clearing at the rear of the tomb. There are two demons back here, and a crystal on a pedestal. Kill the demons and smash the crystal. If you don't smash the crystal Vahkos will curse you throughout the game, usually when it will do the most damage. Once you've finished up in the tomb make your way back to Storm Port and tell Mayor Runkle you've completed his quest. He'll send you to talk to Dana for your reward, and she'll tell you to go look at a book under her bed in her apartment in the northwest corner of town. This book teaches you Healing Lv.3.